This week was a 1-day work week for Matt because of Veteran's Day landing right in the middle of it, so we got to take a day trip further north on the island than we'd been before. We weren't really sure where we were going or what we were planning on doing - we basically just started driving. It was a slightly rainy morning, but seemed to clear up as soon as we started on our trip - that was nice:) Using the Google Map Ap on our Iphones, we knew that we were driving along the west coast of the island toward a town called Nago. You wouldn't think driving around would be much fun, but living in a foreign country, I'm realizing that you will usually always see something new, interesting or beautiful if you do. Just seeing different buildings, stores, beaches, restaurants, bridges, etc. from what we see every day right around our house is fun. We drove along the coast for awhile, seeing a few new Japanese beaches, and large hotels and resorts started to become more frequent as we went further north. From what I gathered, Nago seems to be one of the more "resort-y" areas with some gorgeous looking resorts that we saw along the drive. 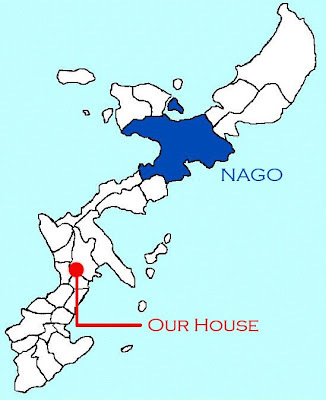 The Nago area is a mix of tropical ocean views to your left and dense jungle with vegitated mountains to your right - a cool mix! The first place we stopped off at was a cliff overlooking beautiful Cape Manzamo. There were a lot of other visitors there site-seeing as well, but we were the only Americans. The furthest we got on our little road trip that day was the central part of Nago, which took us about 1 1/2 hours to reach. This may sound far, but the roads here are small and speed limits are very slow, so we really only went about 30 miles I think. The last place we stopped before we turned around and headed home was a magical land called Pineapple Park... Actually, it was just a little park where they are seriously ALL about pineapples. None of the workers at the park spoke English, so Matt and I wandered around the pinapple patch not knowing where we were going. As it turns out, you aren't really supposed to be walking around the patch as we were. They have pinapple cars that drive themselves and give you a tour. After much wandering around, we eventually found the place where you boarded the cars and started the tour. We also did some Pineapple Wine tasting - not just wine, but Pineapple Champagne, Pineapple Cake, Pineapple Chocolate and fresh pineapple tasting as well. It was a goofy place (best way I can describe it), but we ended up having a fun time! Side note: We ended up taking the Okinawa Expressway (for the first time) to get back home. That is our only expressway here (as far as I know), and it only took about 40 minutes to get home from Nago when we used it.